It's beautiful!! I think about paining my kitchen cupboards every day! I want to do white, but I'm a color person, and don't know if I could live with all white cupboards, so now I'm thinking of doing the lowers black. Can you tell us how you did yours - what brush/roller you used, primer, etc? They look great. I hope the counters wear well. They also look wonderful. I've read that getting a smooth/not distressed finish with ASCP on cabinets is hard. Yours look great without any (intentional or unintentional) distressing. Did you sand between coats? Also what did you seal with? Wax? Poly? I would love to hear how they hold up! I would also love to know if you sealed it with something!! If you used wax, is there any issue using it around the oven due to the heat? Do you have a tutorial on the cabinets? Love the shades, love the countertop, love the open shelves, love the vintage table! This is beautiful. Great job. Pinned!! Beautiful! I just finished painting my top cabinets white & am starting my bottoms ones soon. I'm painting them a darker gray than you used & it's taking me much longer than it did you - I wish I was that fast! i'm so glad you posted this diana...i love your kitchen cabinets and countertops. i need to repaint my cabinets but just hate to start the process. you did a great job (just like with all your projects)! You have done such a great job!!!! I love your place and every thing you have done so far. I follow you on instagram and was hoping for a blog post about it! Love your kitchen!! Your kitchen always looks beautiful but I really like the new paint. Looks awesome and changed so affordably too. looks lovely and those curtains!!! love them too! It's interesting how the green-grays like the French Linen really look pretty with the more pinky neutrals like your floor tiles. I don't know why that is but I like it a lot, especially in an overall neutral scheme like yours. I am going for the same neutral look in my house and have been playing with that as I have some older pinky fixed elements like carpet and tile. That's a good looking kitchen. Did you use ASCP wax over the French Linen? Just wondering because I've used the wax on furniture and am not sure if I like the 'soft' finish. I've heard of people using Annie Sloan paint for cabinets but wonder how it wears. I have varnished doors (yuck) and periodically have to scrub to get the prints/grime off. I'd be afraid the Annie Sloan paint would scrub right off. Love the color. French Linen is one of my favorites. I am in love with your kitchen! I had no idea you could paint counter tops! I want to try that as my teenagers just burned a huge hole in mine. We are prepping our home to become a rental property, so everything you posted is budget-friendly, modern and exactly what we want. Thank you! Wow! Great choice of colors and how innovative to paint the counter top tile! Your kitchen is even prettier than it was before. Your kitchen is stunning. Love the painted tiles on the counter tops. Gorgeous. LOVE LOVE LOVE the cabinets. They look amazing! I've been toying around with the idea of painting mine a light gray. I love my white cabinets though. Love the white on top and grey on bottom idea. So pretty! Looks great! Lovely changes. Live the shelves. It's beautiful! I love the curtains and I'm obsessed with the wood shelves. They really stand out now. So, so homey and pretty. It looks amazing! I'd love it if you could share how you painted your cabinets too. Stunning & Budget Friendly .... WoW !!!! i have always adored a kitchen with open shelves and white dishes..it's so chic and restauranty. well done, so happy to have come across your blog today. can you share the source for the wood shelves? I need some like that for our master bath! Beautiful! Did you use a protective covering of any kind on the cabinets after using the chalk paint? Your new cabinet and counter colors are beyond gorgeous! Brilliant! LOVE those wood shelves. Nice work Diana! Just found your blog from Pinterest - it' great! In our house we call it "if you give a mouse a cookie, then you have to give him a….whenever", I or our adult kids begin renovating, painting, or whatever around our homes. When we redid our kitchen it was a long book. The If you give…book series by Laura Joffe Numeroff and Felicia Bond is one of our favorites. Found your blog through several hops through blog rolls. Enjoyed looking around. Ugh...you give me project fever...wanna come help me paint my cabinets?! Probably my counters too...again. Looks beautiful my friend! Saw this post on printer estate from a friend in KC. It makes me so excited for you when that happens. Your kitchen is absolutely gorgeous! Farmhouse perfection. so beautiful! if you have a more detailed tutorial on how you painted the cabinets and achieved such a smooth finish, i would love that! also, where did you get your bamboo roman shades? I love all your rustic touches-it's perfect as well as your Blog! I love how real & simple your post are! Beautiful home interior designing! I like the furnishing very much! you made a fabulous interior furnishing too! I am considering painting my countertops in our half bath (horrific green tile!!) and I wanted to know how your counters have held up? I have seen some people who have used Homax tile refinishing kit and didn't know how that may compare to your approach. Thanks in advance for any help! Oooo I have some very ugly tile countertops that need this. You painted right on over the grout as well, I assume. How is it holding up these days? I used the oil-based Rustoleum on the trim in my house - 11 years and going strong! Love the stuff, and love your kitchen! How are the cabinets holding up? Has any of the paint come off when you've had to wipe or clean them? Any crackling? I've heard chalk paint naturally crackles. Also, where did you get your bamboo shades? Bravo, well done, I have a interior design blog at http://serenityindesign.blogspot.com. Would love to post an article about this for you. I receive over 55,000 views per month, I will follow your site and you may want to follow mine as well. Love this!! Would you mind sharing what your wall color is please? I am in the middle of a kitchen reno myself and would love to know! I just came across your picture on Pinterest while searching for rustic kitchen shelves. I am starting a redo on my kitchen next week on my own and hoping to keep it super cheap! Do you have any ideas on where to get or make shelves like you have for your dishes? I love the rustic wood look! I tried to find a post on your blog about those open shelves, but couldn't find one. Do you have a post about how you made or where you found them? Thanks! Your kitchen is gorgeous! Where did you find those amazing wood shelves? What paint color did you use for your cabinets? I just love it! What paint color did you use for your cabinets? I love it! Diana, where did you purchase your knobs and handles? Hi there. Did you make your rustic shelves yourself! Where did you get the wood? This is EXACTLY what I'm after! I love your kitchen....you are my inspiration for updating my kitchen!! I really like your shades. I have been searching and searching, but get more confused the more I look. Thanks much and Happy New Years!! Where did you get your shades? They are beautiful in your kitchen. You are an inspiration!! Love your shelves! Where did you purchase the brackets? I love the open shelves!! Where did you find the black rods/brackets that are holding all of the shelves up? Hi! I LOVE your kitchen! It has been my inspiration since my cabinets are a similar color. Can you tell me about your backsplash? Is is wood? If so, I love that alternative to tile! Oh my goodness!! I’ve been searching for kitchen inspiration (we’re moving into our fixer-upper home soon) and I absolutely LOVE how charming and cozy your kitchen is. I especially love the curtains you made from IKEA towels. I’m sharing a link to this post on my blog at www.lifeonshadylane.com - mostly so I’ll have a link to it saved when it comes time to fix up OUR kitchen! THANK YOU for sharing!! I too would like to know how you finished the Annie Sloan paint on your cabinets. ..AS wax?....don't leave us all hanging please! Your kitchen is beautiful!...great job! !! Could you please share about the lower cabinet paint brand and how it's held up? You have a beautiful combination going and your kitchen lighting and layout are very similar to mine. We have 5 kiddos and a super-busy kitchen, so durability matters! Can I ask about the shelving system. Where did you find black brackets? I have been searching, but cannot find them anywhere. Wondering if the French linen is more gray or tan? Your pictures look gray, but the Annie sloan website looks really tan. I'm a bit nervous to purchase the paint. BTW - a picture of your kitchen is what the hubs & i finally agreed on for colors in our kitchen fixer-upper!thanks! Hi Nicole, in my opinion it's more gray than tan. When I bought the paint I was a little surprised because I was also expecting more of the tan color I had seen on the website and from other bloggers who had used it but it was more gray to me than tan. I hope that helps you. Maybe I just got a bad batch? It was frozen when I received it in the mail and I even called them and asked if it was ruined and they said just let it thaw and it should be fine and it was. I wouldn't think that would change the color any. So, who knows. I still loved the color though. It does have some tan in it but it looks more gray to me than the website showed on my monitor. :) Good luck to you! Hi There!! 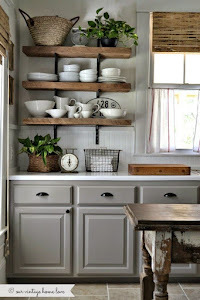 LOVE the open shelves and was wondering where you purchased those wood shelves and brackets?? Hi there Diana! Your kitchen is a DIY work of art... beautifully done! I too was wondering about the wood shelves (reclaimed or purchased new?) and the bracket system... please share :) Many thanks! Can you tell me where you got your shelving? The wood and brackets. Love it!!! I'm also interested, as many before, in the kitchen shelving! Please share with us, thanks!